#Filling your Feed With Happy. Welcome! 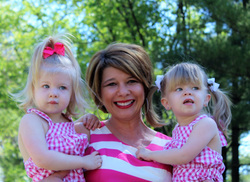 My name is Heidi and I am mom to two beautiful twin girls, a wife, a chef, a decorator, a housekeeper, a sister, a friend and a business woman by day/blogger by night. Well, you get the idea...I've been working hard to find shortcuts to make my life easier, provide time to focus moments with my children instead of the details and I run across something new every day that I think mom's can use in their own lives. Information, products, recipes, and inspiration to keep going through the hard days. We are a proud mommy blog! Our goal is to be a place you land late at night or early in the morning when you have time to yourself to get the cliff notes version on what is needed tomorrow. Because our kids don't come with instruction manuals (they really should it would make things much easier), we aim to provide a fun site with the intent to fill your feed with happy, create a sense of community and provide mommies with a little bit of everything they need in one accessible, easy to navigate, spot. We want to create a space for insight, tips and tricks based on experience, answers to commonly asked mommy questions and a place for mom's to remember about themselves. As a result we will blend all things mommy here. What products worked best, what's easy to cook, hot topics, food for your mommy soul (happy mom = happy kids), home and garden, and finally tips to keep it all together and look presentable too! Let's be really honest. We are mommy's with very little free time for ourselves and what free time we have we typically use to get things done. Prior to having kids I hated getting stuck somewhere by myself (waiting room at doctor's office, in line, oil changes, etc.) requiring me to sit and wait. Now (after kids) I find myself thankful for the extra time (alone) to google an ailment, search for reviews on a product I need to purchase or just staring off into space embracing the time that I have... to just sit. In my experience, timely information and experience insight is critical for mommy's during the formative years of our children's growth. Why? Because it happens so fast! Everyday there is a new need or change. And when you consult a mommy a year ahead of you, often they can't remember the details. This is no fault of their own...we are bombarded things to remember (doctor appointments, home chores, work, family celebrations/details etc), we deal with what's in front of us and move on quickly to the next thing. This makes our short term memory like an elephant and our long term memory a little hazy (in short we're overloaded). In the midst of this we tend forget about ourselves, I'm pretty sure that I didn't look in a mirror for 90 days straight at one point in the last two years. So what's my history? I've been there. I'm starting to see the light but I am living the chaos with you and sometimes it's really hard.